I have a tip for you…there is life and great sips beyond California wines. I am serious. I know, I know, it’s easy to cruise the wine aisles and load your cart up with familiar Sauvignon Blancs and Cabernets. Heck, I‘ve done that lots of times myself. What I’d like to suggest to you is to slow down and take time to explore your favorite wine store or online merchant for some exquisite – and affordable- wines from some other countries. I promise you, there is some really good stuff out there. 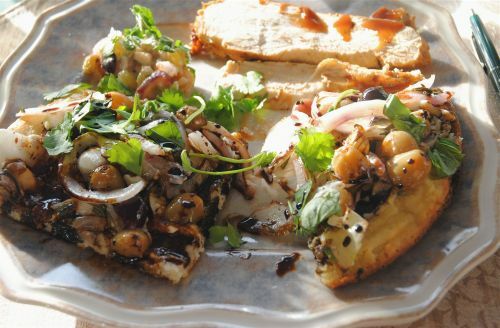 And if you’re feeling particularly adventurous, be courageous and pair some interesting foods with your new found wine finds. I sense some hesitation out there and an eye roll or two. Looking down or shrugging your shoulders does not mean I can’t see you. Not feeling quite up to the whole Indiana Jones of wine adventure? OK. Let me make it easy for you. Here are my suggestions for three wines and food pairings that are easy to find, affordable and are most certainly going to rock your wine world. Kaiken Torrontes and pizza make a great match. Photo courtesy of Terrontes. 1. 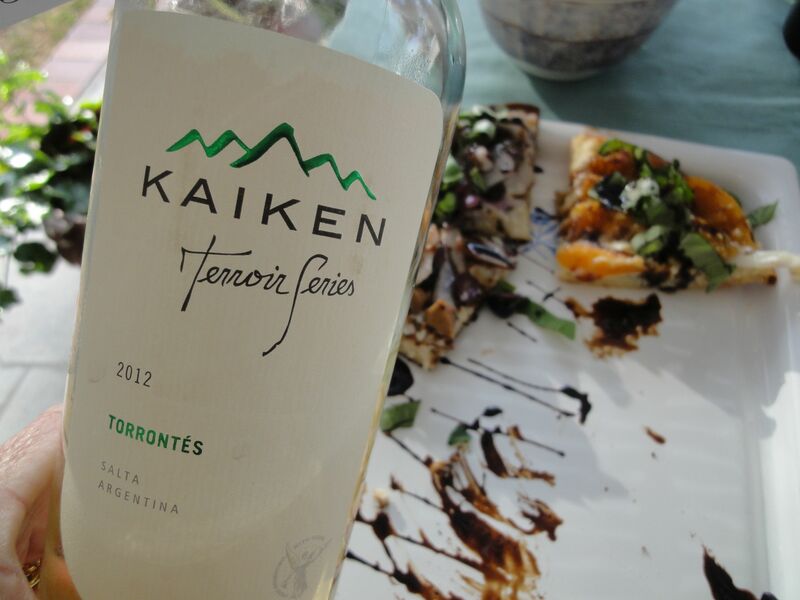 Kaiken Terroir Series Torrontes 2012/ $15. Pairing: Medjool Date Chicken Salad. Torrontes is considered the most distinctive of all white Argentine wine with a showy nose that is both crisp and fruity. The wine has an elegant nose with a medium aromatic intensity and a touch of Muscat and tropical fruits aromas. In the mouth, it’s a fresh sassy wine with a smooth texture, balanced acidity and a long and pleasant finish. What this means to you is a white wine that goes with just about any food you might be having – even red saucy items like pizza and chili. This is my number one recommendation for you to seek out. The Malbec pairs well a variety of bites. Photo courtesy of ©tvm Todd Montgomery. 2. Kaiken Corte Malbec (80%) –Bonarda (12%) -Petit Verdot (8%)/ $9. Pairing: Bison Sliders. Stellar wine with intense red color and violet hues. Ripe black fruit on the nose, such as blueberries and blackberries, is going to delight and entice you. You’ll be able to identify with the distinct Malbec type floral aromas. In the mouth, this big bodied blend brings out all the silkiness of a Malbec backed by the structure and freshness of Petit Verdot, ending with a mineral finish provided by the Bonarda. Expect a long and lingering finish. From the Uco Valley. 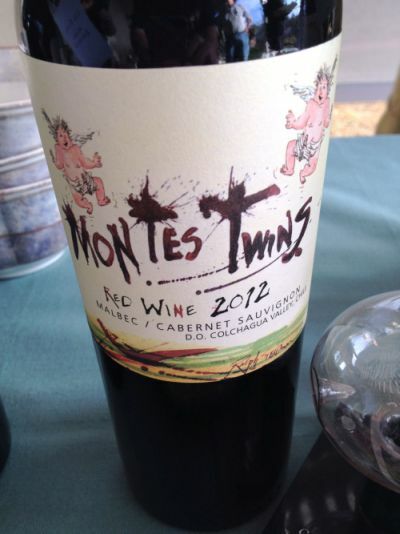 Montes Twins Red Wine. Photo courtesy of ©tvm Todd Montgomery. 3. Montes Twins Red Wine 2011/ $18: Pairing: Spicy BBQ chicken breast followed by a coconut cookie chaser. Meet the twins! A masterstroke of varietal blending from Chile’s winemaking legend, Aurelio Montes. On their own, Malbec and Cabernet Sauvignon shine, but when paired up, these two classic varieties complement each other perfectly. It’s a dramatic double bill: wonderful richness, structure and fruit from the Cabernet, with smooth, velvety texture from the Malbec. These varieties add up to a wine that’s greater than the sum of its parts. The oak aging contributes subtle notes of vanilla and earth, and its soft tannins provide an especially elegant finish. One critic gave it this verbal award, “This 50% Malbec, 50% Cabernet Sauvignon (hence, the “twins”) is a magnificent blackberry, licorice and spiced specimen of tightly wound Cab and velvet-gloved Malbec. The bodies are textured and in motion, empowered by grace and elegance.” Yup, that just about sums it up. International wines are one of the world’s greatest pleasures. In terms of complexity, longevity, soulful sense of place and sheer refreshment. Wines outside of California are not merely a great sip, but a benchmark taste on your wine journey. So my wine warriors, grab you credit cards and let’s find some great international wines to add to your wine cellar and dinner table. To read the Luxe Beat Magazine version of this article click on the title Worldwide Wine Tip and Sips. Love your descriptions and agree with your argument. There are so many wines to be tasted. Thanks, Linda.